Harnessing the wind to generate electricity is often cheap and easy. You can build a simple wind turbine to power small appliances or to complement your home's power. Some experience or expertise with electronics is helpful, but anyone can learn the basics of what it takes to build your own windmill. Building your own wind generator can be easy and inexpensive. Cut the PVC pipe into four pieces.These will be your blades. Your generator needs only three blades; the fourth blade will be a spare. For shorter or longer blade lengths, your pipe should be one-fifth as thick as it is long. For example, if the PVC pipe is 50 cm long, it should be 10 cm in diameter. Shape the blade into a rectangular base to attach it to the generator, and cut it at an angle lengthwise to make it look like an airplane wing. You may also use a sander to smooth out the shape and make it rounder. Create a wind vane by attaching the heavy sheet aluminum upright to the back of your two by four piece of wood. 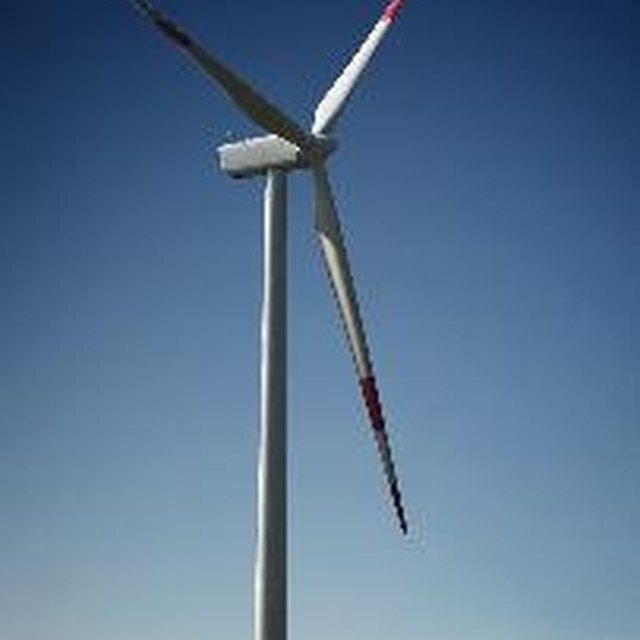 This will help the turbine to face the wind and will serve as the tail of the wind turbine. Connect the blades to a round hub at an equal distance from each other. You need a hub with a hole that can easily fit into the motor shaft of the wind generator motor. You can find one at your local hardware or home supply store. It should have enough space to bolt the three PVC pipe blades. Use at least two bolts on each blade, making sure they are evenly spaced and lined up toward the center of the hub. Bolt the wind generator motor to the opposite end of the wind turbine's tail and cover it with PVC pipe to protect it from the weather. Mount the tail and wind generator motor to the 10 feet of steel conduit. This will be the pole of your windmill. Bolt the hub and the blades to the wind generator motor shaft and wind tail. Connect the wind generator motor to an external controller for wind power systems which can easily be found on eBay. This will allow you to connect a battery and an inverter to plug-in appliances. Run the cable from the motor through the conduit pipe hole down to the ground and to the external controller. Talk to your local hardware store expert about suitable equipment for your electricity needs. The blades can spin very fast. Please exercise caution when handling the blades. What Are the Parts of a Portable Generator?